1) Open the “Main Topology”. 2) Double-click with the left mouse button on the desired OLT (for example, MA5683T). 3) On the left in the list, open “GPON” – “GPON Management”. 4) By default, the tab “GPON UNI Port” opens, it is just needed, click on the right “Find”, so a list of all GPON ports will be displayed. 5) Select the desired GPON port, at the bottom open the tab “ONU Info” and in the lower right corner click the button “Auto Discover ONUs”. A new window should display a new unregistered ONT, select it, click “Confirm”, then select “GPON Line Profile” and “GPON Service Profile”, in “Alias” we will write a description of the ONT in English letters, for example, the client’s address and click “OK”. 6) Now it remains to add “Service Port”, for this, in the same tab “ONU Info” we find the new added ONT, double-click on it with the mouse, in the opened window click “Advanced” and select the tab “Service Port Info”. 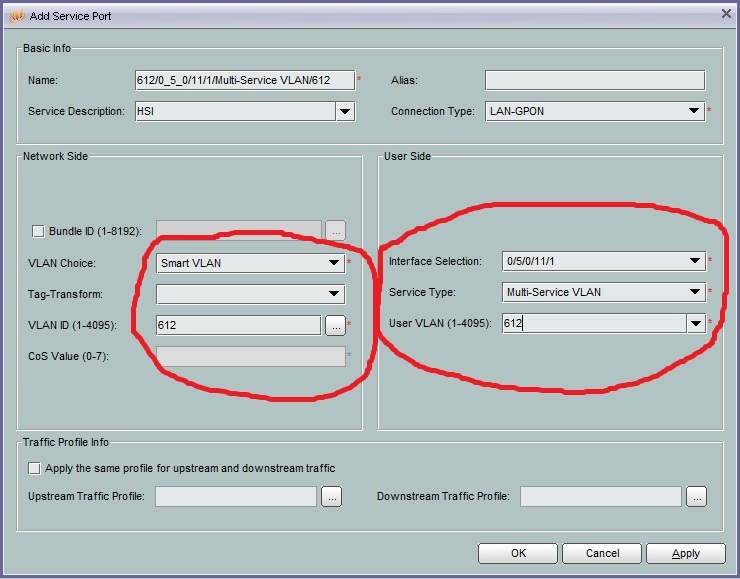 Click the right mouse button and select “Add”, in the opened window in the “Network Side” block we will indicate “VLAN ID”, and on the right in the “User Side” block we will select “Service Type: Multi-Service VLAN” and specify the same “User VLAN”. Click “OK”, then the Internet should work. It remains to save the settings, returning to the “Main Topology” tab at the top and after right-clicking on the OLT (for example, MA5683T), select “Save Date Immediately”.